This mouthwatering Mediterranean salad makes picnic perfect. Preheat broiler. Brush eggplant slices with oil. Broil 4 inches from heat source 12 to 15 minutes, turning once, until tender and lightly browned; cool. Cut eggplant into 1-inch pieces and place in large bowl. 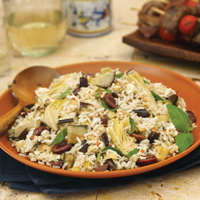 Add rice, artichoke hearts, olives and basil. Combine reserved liquid from artichoke hearts and feta cheese. Drizzle over salad and gently toss to coat. Season with salt and pepper to taste.